Tears streamed down children’s faces in St. Cecilia’s Church, Solvay, today as the classmates of Margaret (Mugsy) Spillane, 12, and her brother, William (Billy) Spillane Jr., 10, who burned to death in the fire that destroyed their home at 219 Darrow Avenue, early Thursday (January 14), attended the children’s last rites in a body. From Boyd School and Intermediate School, Solvay, the children came to the church. Mugsy’s classmates carried the casket that contained the charred remains of the two children into the church. Claude Wells, Arnold Armani, John Neary, Gerald Raussa, Eugene Wells, Robert Pierson, William Masterpole and John Terry were the boys who acted as bearers. 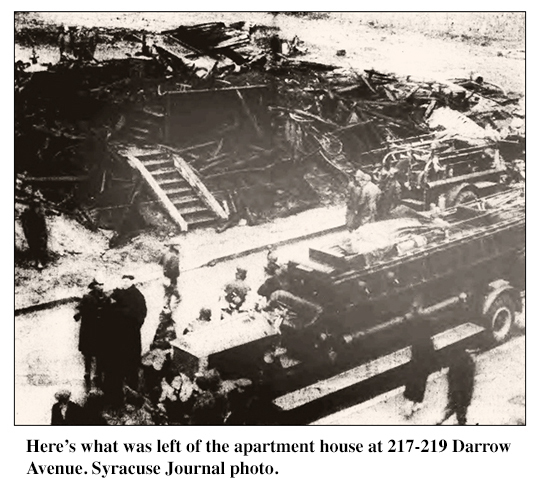 The father of the two young fire victims, William Spillane Sr., a widower, headed the line of mourners that included scores of relatives and other Solvay residents. Father Charles Stuczko celebrated a solemn high mass of requiem, assisted by Rev. Thomas J. Driscoll as deacon and Rev. Joseph B. Delahunt as subdeacon In 9erment took place in Assumption cemetery. Twelve members of four families escaped the inferno which leveled the three-story apartment house and set fire to ten nearby structures. The two victims were children of William Spillane. His three other children, Ellen, 8; James, 7, and Catherine, 13, escaped unharmed. The older girl was attending a dance at the time. Other occupants of the apartment house were Mr. and Mrs. Mason Ingersoll, who lived on the third floor with their 3-month-old daughter; Mr. and Mrs. Anthony Cardozo and their two children, Anthony and Delphine, 7, living on the first floor, and Mrs. Ernest Knepper and her daughter, Catherine, 12. They also resided on the third floor. On the same evening of the Solvay tragedy, four young children were killed in a home fire in Ogdensburg, New York. St. Patrick's Day, March 17, was good for the Irish and Solvay's Republicans, who won all five offices at stake in the village election. John J. Degan was re-elected mayor, with 1,990 votes to 1,584 for his Democratic opponent, Morris P. Fennelly. Daniel F. Mathews polled 1,972 votes, and was elected police justice over incumbent Democrat, Ambrose D. Ginnelly, who received 1,566 votes. For trustee in the First Ward, Raymond A. Leachtner defeated Harry V. Pettitt, 744 to 451; in the Second Ward, Anthony F. Weslowski, Republican, defeated Anthony Olgeaty, 688 to 390, and in the Third Ward, Frank J. Kinder defeated Harry Lutzy, 536 to 502. There were 3,574 votes cast, largest in village history. Wages of all hourly workers at the plant of the Solvay Process Company, subsidiary of the Allied Chemical and Dye Corporation, have been raised seven cents per hour, it became known today. This follows an increase of six cents n hour which went into effect last fall. Nearly 1,500 hourly workers are benefited by these wage increases. No general change has been made in the salaries of Solvay Process employes who are on a weekly or month basis, it was said at the office of the company today. The Solvay village board, in its first meeting since the annual election, voted to fully restore pay cuts imposed on full-time employes of the village several years ago. The pay restoration ranged from 35 to 50 percent. About 40 workers were affected. Excluded were part-time employes, including members of the village board — the mayor and trustees — who have other employment. At least 200 loaves of crisp Italian bread, part of the night’s batch at Anthony Angarana’s bakery, 104 First Street, Solvay, were ruined shortly after 6 a.m. today when soaked by water used by Solvay firemen in fighting flames in a truck in the bakery driveway. Short-circuited motor of the bakery truck flared up, firemen believe, and sent flames racing through the body of the machine to a shed roof overhead and finally to the adjoining bakery building itself. Whether the Feast of Assumption was the usual two-day affair, I could not tell from the Syracuse Journal account, but apparently what we always referred to as the August 15 Field Days was wilder than usual — at least, on August 15. An estimated 15,000 people showed up at what was called the Gertrude Street carnival grounds. (I was only familiar with the field days at Woods Road Park.) Perhaps the Gertrude Street carnival grounds were where the high school now stands. If so, the traffic jam described by the Journal is understandable. That was no place for 15,000 people. Adding to the excitement was a grass fire that broke out soon after the fireworks display began. But the village fire department quickly extinguished the blaze. Another feature of the early celebrations was band music, which was played throughout the evening. Chlorine gas, escaping from ten tanks stored in the trailer van of a large motor transport that burst into flames early today at Montrose and West Genesee Street, felled eight Solvay firemen and an unidentified woman. Fire Chief Norman James, 117 Caroline Avenue; Capt. James Costigan, 314 Hall Avenue; Lt. John Olgeaty, 205 King Avenue, and firemen William James, 117 Summit Avenue; Timothy Stapleton, 117 Caroline Avenue; John Mosher, 205 Charles Avenue; Kenneth Dack, 200 Lionel Avenue, and Florindo Papaleoni, 105 Freeman Avenue. Papaleoni and Dack were believed most seriously affected and were in bed today at their homes on the advice of physicians who warmed them one effect of the dangerous fumes is to make them susceptible to pneumonia. All three Solvay fire companies — Mountain Stop, Prospect and Tanner — responded to a general alarm at 3:30 a.m. at the outbreak of the spectacular truck fire that spread gas fumes over a wide area and endangered sleepers in nearby homes. The affected firemen and the unidentified woman spectator happened to be closest to the rear of the truck when the fumes suddenly began to pour out from the gas tanks which became overheated as flames swept through the interior of the trailer. Coughing and gasping, the victims managed to get away from the scene, seeking fresh air,, as unaffected firemen, from a safer distance, kept playing streams of water on the fire. Those affected were taken to the emergency room of the Solvay Process Company. Arthur Woodard, 194 Landon Street, Buffalo, driver of the motor transport for the Keeshin Motor Express Company, 207 West Taylor Street, escaped harm. He explained later to Patrolman James Demperio of the Solvay police, that he had stopped the transport in a gasoline station driveway at Montrose Avenue and West Genesee Street, when a rear tire went flat. It was while he was jacking up the trailer to change the tire that the fire started in some undetermined manner. The truck was filled mainly with boxed hairpins, and the flames spread rapidly through their paper containers as well as through the bales of burlap and cotton carried in the miscellaneous load. Woodard shouted to a passing motorist, Mark Tiernan of Fay Road, who drove to Solvay police headquarters and sounded the night alarm that roused a large part of the village. The fire had gained such headway and generated such intense heat by the time firemen arrived that several bushels of hairpins were partially fused. When the gas began to escape from its storage tanks and felled the firemen and the woman, other firemen aroused sleepers in a nearby home, that of Dr. I. F. Brenning, 107 Montrose Avenue, to warn them of the danger. Kenneth Dack recovered quickly, and on Christmas evening was credited with saving three unidentified children from a burning automobile after the gasoline tank exploded near Woods and Boulder Roads. Dack was visiting a friend nearby when he heard the explosion and ran outside. He turned in an alarm for firemen, then pulled the children from the vehicle. Using blankets, he had the blaze under control when firemen arrived. Mrs. Rose Demperio of 502 Second Street, awoke in time to lead her four children to safety after finding the house filled with gas fumes. Taken to Syracuse Memorial Hospital in an ambulance with Raymond Demperio, 10, and Albert Demperio, 5, sons of Mr. and Mrs. Raymond Demperio, and their sister, Rose, 11. Mrs. Demperio and another son, Arthur, 4, were less seriously affected. Mrs. Demperio said she awoke shortly before 7 a.m., suffering from a headache due to the fumes. She managed to get out of bed, despite feeling weak, and made her way to the kitchen, where she closed burners on the kitchen stove. Solvay police reported a pot of water left heating on the stove apparently had boiled over and extinguished the gas flame, allowing fumes to escape. Mrs. Demperio, a barber, was on a business trip at the time. Screaming fire sirens on the three engine company houses of the Solvay fire department, the usual signal for a fire of serious proportions, brought volunteer firemen running from all directions late Friday afternoon. But there was no fire, and there was no false alarm, either. The noisy fire signal was an emergency device used to bring all the firemen together and let them know that the department’s oldest and most popular member, Orlow D. Joslin, 71, a carpenter, of 516 Second Street, is facing death at Syracuse Memorial Hospital and is in urgent need of a blood transfusion to prepare him for an operation. To Mountain Top Hose Company, to Tanner Hose Company (his own outfit), and to Prospect Hose Company, the fleeter, younger members of the department hurried in response to the alarm. Soon they all were congregated at the fire houses and joined by older men, many driving to the fire houses from their homes. “What’s up?” they all asked and turned to the various company officers, expecting to get the location of a fire. But instead they were told about Orlow Joslin’s condition. Similar requests for volunteers were made at the other two fire houses in the village at the same time. The response was so great that for awhile Fire Chief Bert Larkin and other fire company officials were wondering how they could ever handle the rush of volunteer blood donors to the hospital, where the blood tests were to be made. Practically the entire department responded, so the volunteers were divided into groups to be tested until the proper type of blood was found for the transfusion. Four men with the required type were found in the first group of 17 volunteers to appear at the hospital. Those first responding to the appeal were John Olgeaty, John Friedli, James Reilly, Asher Cohen, Michael Radford, Gerald Blair, Lawrence Dwyer, Arnold Friedli, Edwin Hardy, Robert Mosher, Louis Fancher, Peter Miller, Frank Conway, R. M. Dack, William Major, Fire Chief Larkin and Michael Welch. It was the most overwhelming response to an appeal for blood donors in local medical history, and during this weekend the life-saving transfusion will be performed prior to the operation needed by Joslin, a member of the Solvay Fire Department ever since it was founded. The operation was advised by attending physicians to remove a gall bladder outlet obstruction and relieve Joslin’s suffering from resultant jaundice. His illness has so affected his blood that proper coagulation will not take place and other blood is needed to prevent excessive bleeding during the operation and insure coagulation and healing afterward. The charter member of the fire department doesn’t know how the village alarm signals were sounded to bring out fellow firemen in his behalf, but although his condition is serious, he realized that they’re all coming to his aid and he’s facing the operation confidently, which surgeons say is half the battle. And Orlow Joslin expects to continue as an active member of the Solvay fire department as soon as he gets out of the hospital, having answered every fire alarm in the village except his own for years. So fellow firemen say that is wasn’t a false alarm to blow the village fire whistle when there wasn’t a fire. Orlow D. Joslin died March 16 at Syracuse Memorial Hospital. He was a native of Oneida Castle and moved to Solvay 48 years ago, serving the Solvay Process Company for 42 years as a carpenter before leaving the company to do similar work in Onondaga County parks. Besides his wife, Mrs. Minnie Joslin, Mr. Joslin was survived by several nieces and nephews. Bowler Frank Livignale of Solvay rolled a perfect game of 300 April 30 at the Potters Club Alleys in Syracuse. Mother Goose stories were the theme of the annual June Festival at Woods Road field. Participating were nearly all of the students in the Solvay schools. High school senior Margaret Maestri reigned as queen of the June 3 event. Burr Blodgett, a lifeguard at the Danforth salt pool on Onondaga Lake Parkway, saved a Solvay man from drowning on August 5. Frank Rodrigues of 307 Center Street, was in ten feet of water when onlookers noticed he was in distress. Blodgett swam to the rescue, and after a brief struggle with the panicked Rodriguez, brought the man safely to shore. Blodgett, a Syracuse resident, was manager of the Syracuse University football team. If you would live to a ripe old age, keep healthy and keep busy. This is the advice of Edward Needle Trump, one of the foremost men of the day in the realm of mechanical and chemical engineering. And yesterday, on the 80th anniversary of his birth, Mr. Trump was busy following his own advice. Vice president of the Trump Corporation and president of the Hotel Syracuse, Inc., Mr. Trump spent his 80th birthday working out the details of a new method of his for dissolving rock salt, by attacking the bed at the bottom instead of at the top, thus preventing caving of the well. He has approximately 50 patents to his credit now,, this white-haired, quiet man, who has had a lifelong interest in matters of scientific import. But that doesn’t mean that he shouldn’t continue to increase his interests. And he does. A list of his activities at the present time, to say nothing of other activities during his lifetime, looks like a page from Who’s Who. Descended from a long line of ancestors noted for high mental attainments, Mr. Trump was born in Philadelphia on November 9, 1857. He studied at Cornell University as a special student in mechanical engineering under John E. Sweet, and in 1879 built the first beet sugar plant in the state of Delaware. He operated this plant for the following three years, coming to Syracuse in January, 1882, at the request of the late John E. Sweet, to accept the position of assistant to W. B. Cogswell, founder of the Solvay Process Company. For a time after moving to Syracuse Mr. Trump lived at the corner of Avery Avenue and West Genesee Street in what he describes as “the only house in the block either way.” Later he built a house at 1912 West Genesee Street in the same block, in which he has resided to this day. He served as general manager and chief engineer for the Solvay company until 1913 when he was elected vice president of the concern and head of the technical committee. These various duties he filled with characteristic ability and efficiency until 1921 when he turned over the active duties in these connections to other hands, and became consulting engineer for the Allied Chemical and Dye Corporation, a consolidation of five different chemical companies, including the Solvay Process and the Semet-Solvay companies. He resigned in 1930. It is almost impossible to list all of his other affiliations. He was the first chief engineer, general manager and vice president of the Semet-Solvay Company; was formerly associated with John E. Sweet in the Straight Line Engine Company, was for many years president of the Direct Separator Company, and was president of the Humphrey Gas Pump Company and of the Stumpf-Unaflow Engine Company. In addition to his present affiliation with the Sanitary Metal Cap Corporation, the Trump Corporation and the Hotel Syracuse, he is a member of the grade crossing commission, the Central New York park commission, a trustee of the Onondaga County Savings Bank, an honorary member of the Technology Club, a member of the Institute of Chemical Engineers, a member of the American Society of Mechanical Engineers, with which he has been affiliated 55 years, and a member of the Engineers Club of New York. Miss Margaret Canestraro, 18, 104 Gertrude Avenues, Solvay, a student at Powelson Institute, died September 15, in an automobile accident on Belle Isle Road. Injured in the accident were Miss Carolyn Nicit, 18, 307 Second Street, Solvay; James Romano, 18, 215 John Street, and James Corso, 20, 436 Seymour Street,, driver of the automobile which clipped a utility pole. Romano died two days after the accident. James B. Galante, 329 First Street,, well-known Solvay restaurant proprietor for many years, died April 6 of pneumonia. Born in the Tyrol 62 years ago, he came to the United States and settled in Solvay in 1892. He and his brother, Louis Galante, established a restaurant in Solvay over 30 years ago, their last location being 2253 Milton Avenue. Surviving are his wife, Mrs. Rose Galante; two sons, James B. Galante Jr. and Henry Galante; three daughters, Mrs. Lawrence Armani, Mrs. Frank Bailo and Miss Anna Galante; a sister, Mrs. Filomeno Turneri, and three grandchildren. Charles G. Gronau, 71, active member of the Solvay volunteer fire department and a retired employe of the Solvay Process Company, died July 20 at Crouse-Irving Hospital. Cause of death was listed as pneumonia. Born in Danzig, Germany, Gronau came to the United States when he was 21. Survivors: His wife, Mrs. Rose Gronau; six sons, John, William, Max, Frederick, Edward and Ernest Gronau; a brother, John Gronau; four sisters, Mrs. Frank Stark, Mrs. August Adams, Mrs. Frank Williams, all of Solvay, and Mrs. William Gleason of Washington, D.C., and several nephews, nieces and grandchildren. A bullet fired at a blackbird by a 15-year-old Solvay boy shortly before noon today across the old canal at Gere’s Lock struck a 7-year-old girl instead, killing her almost instantly. The victim is Mary Haresky, 7-year-old daughter of Mr. and Mrs. Michael Haresky of 99 Gere’s Lock. She was pronounced dead by Dr. James D. Wands of 205 Orchard Road, Solvay, when she was carried into the physician’s office by Solvay police officers. A neighbor’s son, Raymond Malys, 15, of Belle Isle Road, was said by Solvay police to have pulled the trigger that sent a .22 caliber bullet into the child’s abdomen. He was standing on the south canal bank at the time. First realization that he had wounded the little girl, instead of hitting the blackbird, was said to have come to the boy when he saw the wounded child crawl out from behind the bush on which the bird had been roosting. The bush was near a concrete abutment on the north side of the old canal at Gere’s Lock, and Mary staggered out into sight, fell once, and tried futilely to rise again. The young marksman yelled to nearby residents for help, and they summoned Mary’s older brother, Peter Haresky, 24 who placed the child in his car and drove into Solvay and the village police office. Miss Beulah Howell, 34, 207 Lionel Avenue, Solvay, died May 10, ended a two-year battle to recover from injuries suffered in a collision between a heavy truck and a bus in which she was a passenger. She was one of several persons injured. She was the daughter of Mr. and Mrs. George Howell, and a former Sunday school teacher at Asbury Methodist Episcopal Church. Frances Quinn, nine-year-old daughter of Mr. and Mrs. Michael Quinn of 228 Woods Road, Solvay, died September 22 in Crouse-Irving Hospital of peritonitis, stemming from a blood infection. She was a fourth grade pupil at Prospect School. Surviving besides her parents were to sisters Mae and Joan Quinn, and a brother, Thomas Quinn. Carl Romberg, 38, 230 Charles Avenue, Solvay, died June 13 in the veteran's hospital in Batavia. His death was attributed to a hip wound he received in 1918 in the World War battle of Belleau Wood, in France. He spent sixteen years in government hospitals, undergoing 20 operations. 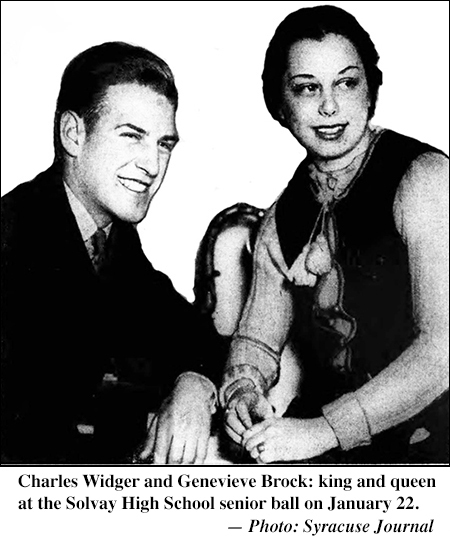 He was survived by his wife, Mary, whom he married just before leaving for overseas. August Smith, 43, of 1615 Milton Avenue, Solvay, died January 21 of injuries suffered when he was struck by a swinging crane and crushed between the crane and a junk pile. The accident occurred on a lot used by the victim's employer, the Syracuse Surplus Company, at 114 Hiawatha Boulevard West. Solvay High School's basketball team barely made it into the county league playoffs, and was eliminated in the first round. After a slow start, the Bearcats improved down the stretch, and enjoyed a 25-19 win over arch rival Camillus, which had entered the game in first place. To understand the Solvay-Camillus rivalry, which died when West Genesee High School was born, think of the Syracuse-Georgetown rivalry when both were members of the Big East Conference. Solvay players in the 1936-37 season included Brostek, Salvetti, Aurelli, Vellano, Capella, Mitchell, E. Borrell, Weslowski and Szczech. Unfortunately, the Syracuse Journal provided no first names. For the second straight year, Solvay High's baseball team was undefeated during the regular season, but lost the in the playoffs,, this time to North Syracuse, 2-0, in the Onondaga County League championship game on June 5 at Griffin Field in Liverpool. Players on the team included H. Pettitt and Weslowski, as pitchers; Szczech catching; Grobsmith, Mancabelli, Delvecchio, Ezzo, Barnello, Speziali, and S. Pettitt. At one point in the season, Weslowski pitched back-to-back one-hitters, against Jordan and Split Rock. However, North Syracuse had a pitcher named Weaver who pitched back-to-back perfect games during the season. Solvay's track team, coached by Joe Paussa, won the Onondaga County League track meet on June 5, for the third straight year. The Bearcats mile-relay team set a new meet record of three minutes, 47.2 seconds. The four runners were Floyd Tagliaferri, Alex Sadowski, Francis Gilbert and Louis Saule. Other Solvay stars at the event included Piaseki, Angarano, Raymond, Vellano, Patapow, Capellla, Smith, and Corey. Solvay High's football team finished in a first place tie with North Syracuse and Liverpool in the county league. Solvay's starting line-up: Demperio, le; Angarano, lt (and place kicker); Patapow, lg; Tindall, c; Pettitt, rg; Mascette, rt: Szczech, re; Vallano, qb (and captain); Raymond lhb; Ezzo, rhb; Barnello, rb. Also on the team: Glisson, Cadwell, O'Leary, Gettino, Olgeaty, Walters, Bagozzi, Pirro, and Mazzochi. Solvay graduate Rocco Pirro, playing fullback, scored a touchdown to lead Catholic University to a 27-14 win over South Carolina on November 25, which was Thanksgiving Day. Solvay High's hockey team opened the season by defeating defending champion North Syracuse, 4-1. Players included Tindall, Cadwell, Mascette, Stasko, Degan, Kassing, F. Tarolli, A. Tarolli,, Patchin, Welch and Rydelek. The basketball team opened the 1937-38 season with a 30-28 win over Baldwinsville, then was hammered by Camillus, 43-24, and in its final game of the year, beat Split Rock, 29-19. A piece of trivia: On December 11 the Syracuse University freshman basketball team beat Morrisville, 51-21. SU coach "Ribs" Baysinger played 25 — that's right, 25 — players in the game.